Penicuik travelled to Fauldhouse on a wild, wet and windy day for this East of Scotland Premier League match that was to be influenced by the strong wind blowing the length of the park. Penicuik opted to play with the wind at their backs, and as expected dominated the play for the first half hour. In the 7th minute a Harvey shot appeared to be handled in the box, but the referee was unmoved. Six minutes later, Bald had to be alert to cut out a dangerous low cross into the six-yard box. 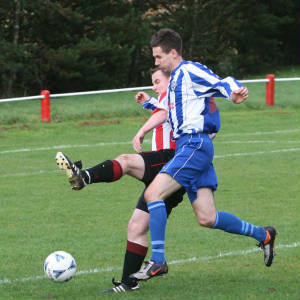 Then following some pressure by Penicuik, a Gray drive was deflected past the post for a corner. MOONIE fired the corner kick with pace into the box and the strong wind curled the ball past keeper Brunton into the net. In the 20th minute, the same player showed great tenacity in refusing to give up the chase, won the ball and crossed it to the back post. Gay rose above the defence, but failed to hit the target with his header. At the other end a speculative McNight shot looped over the crossbar. 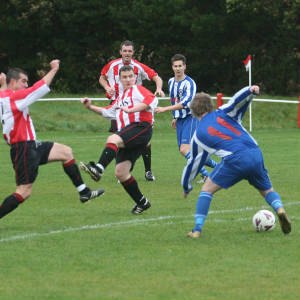 Then, following a slick passing move by Penicuik, Kelly was upended at the edge of the penalty box. From the free kick, MOONIE drilled the ball low into the bottom right hand corner of the net. 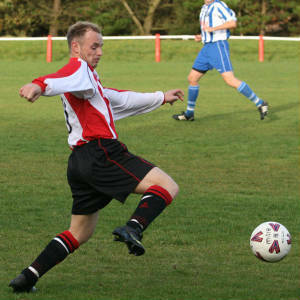 Shortly afterwards, a Gay free kick was headed narrowly past the upright by Kelly. 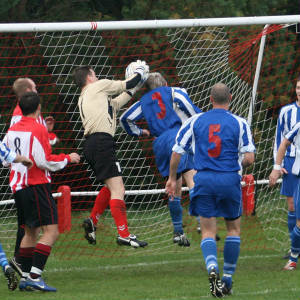 With Penicuik in control and pressing hard, keeper Brunton came to the rescue to nip the ball off Harvey’s head. In the 32nd minute, Steel was dispossessed inside his own half and MARTIN drove in on goal to coolly slotted the ball past Bald and get them back in the game. In the 41st minute, Penicuik had Bald to thank when he rushed out to prevent a Fauldhouse equaliser. Just on half time it was Brunton’s turn to save the day when he snatched the ball off Steel’s head just as it looked like he would head home a Moonie corner kick. Two minutes into the second half, a cross by Martin deflected off Lynch, hit the post and was thumped clear. With the strong wind behind them Fauldhouse were pinning Penicuik back in their own half and in the 60th minute, a long range shot by McLenaghan went a foot wide of the upright. Then in a great move by Penicuik Gay laid the ball off to Harvey but his first time shot curled inches over the crossbar. In the 66th minute, Fauldhouse got the equaliser when MARTIN had the easiest of tasks to tap home from inside the six-yard box.